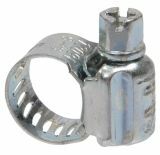 Screw clamp, TORK, 18-25mm TORK clamps for water and gas connections for hoses with an outer diameter of 18 to 25 mm. Hose clamp 12-19mm Pipe clamp for water and gas pipes fastening. Hose-pipe external diameter ф12-19 mm. Hose clamp 8-12mm Pipe clamp for water and gas pipes fastening. Hose-pipe external diameter 8-12 mm. List Price 0.30лв. VAT Incl. 0.28лв. VAT Incl. 0.27лв. VAT Incl. 0.25лв. VAT Incl. Hose clamp 13-19mm Pipe clamp for water and gas pipes fastening. Hose-pipe outer diameter 13-19 mm. Hose clamp 16-23mm Pipe clamp for water and gas pipes fastening. Hose-pipe external diameter 16-23 mm. List Price 0.30лв. VAT Incl. 0.27лв. VAT Incl. 0.24лв. VAT Incl. Hose clamp TORK 16-25mm Pipe clamp for water and gas pipes fastening. Hose-pipe outer diameter 16-25 mm. Hose clamp, TORK, 20-32mm Pipe clamp for water and gas pipes fastening. Hose-pipe external diameter 20-32 mm. Hose clamp, TORK, 23-35mm Pipe clamp for water and gas pipes fastening. Hose-pipe external diameter 23-35 mm. List Price 0.45лв. VAT Incl. 0.42лв. VAT Incl. 0.40лв. VAT Incl. 0.38лв. VAT Incl. Hose clamp 28-48mm Pipe clamp for water and gas pipes fastening. Hose-pipe external diameter 28-48 mm. List Price 0.50лв. VAT Incl. 0.47лв. VAT Incl. 0.45лв. VAT Incl. 0.43лв. VAT Incl. Hose clamp 32-50mm Pipe clamp for water and gas pipes fastening. Hose-pipe external diameter 32-50 mm. List Price 0.60лв. VAT Incl. 0.57лв. VAT Incl. 0.54лв. VAT Incl. Hose clamp 40-60mm Pipe clamp for water and gas pipes fastening. Hose-pipe external diameter 40-60 mm. List Price 0.55лв. VAT Incl. 0.52лв. VAT Incl. 0.49лв. VAT Incl. 0.47лв. VAT Incl. Hose clamp 50-70mm Pipe clamp for water and gas pipes fastening. Hose-pipe external diameter 50-70 mm. Hose clamp 10-16mm Pipe clamp for water and gas pipes fastening. Hose-pipe external diameter 10-16 mm. Hose clamp 14-22mm Pipe clamp for water and gas pipes fastening. Hose-pipe external diameter 14-22 mm. Hose clamp 60-80mm Pipe clamp for water and gas pipes fastening. Hose-pipe external diameter 60-80 mm.